Caller to BBC Persian: I noticed great solidarity among the people. As soon as someone was struck by the security forces, people would rush over to help, give some sweets or comfort. I did not see any fatigue among the protesters. I was in Karim Khan Zand from 10 AM. They would beat us, then we'd go to the next street. They'd beat us again and we'd go elsewhere again. Mohammad in Tehran to BBC Persian: I got off at Mofatteh subway station. From there, all the way to Enghelab Square, the security forces wouldn't allow more than a dozen people to assemble. On a street leading to Karim Khan, I saw a painful spectacle. Motorcycle riders attacked about a hundred protesters and one young man was bludgeoned so brutally that he lost consciousness. The Basijis were so young. Some wielded electric batons. The police was brutal enough, but the Basijis knew no boundaries. I saw one Basiji lurch into a crowd with his motorcycle. Footage of protesters arriving for counter-rally earlier today. The subway stations near the protest meeting points -- Taleghani, Ferdowsi, and Hafteh Tir -- were closed and demonstrators were confronted with heavy security measures as they left stations near major squares. The New York Times published an article on today's clashes in Iran. 'Iran's beleaguered opposition movement struggled to reassert itself on Wednesday as tens of thousands of protesters skirmished with the riot police amid clouds of tear gas on the sidelines of a major government-sponsored anti-American rally,' the paper reported. BBC Persian reports that protests took place today across the country, including the following major squares in Tehran: Azadi, Enghelab, Hafteh Tir, Ferdowsi, and Vanak. Security forces exhibited much greater violence than on previous occasions. People tearing down Khamenei's picture and trampling it is a symbol of the Leader's lost position as an unbiased authority. Iran must choose. We have heard for thirty years what the Iranian government is against; the question, now, is what kind of future it is for. The American people have great respect for the people of Iran and their rich history. The world continues to bear witness to their powerful calls for justice, and their courageous pursuit of universal rights. It is time for the Iranian government to decide whether it wants to focus on the past, or whether it will make the choices that will open the door to greater opportunity, prosperity, and justice for its people. 'Brave Karroubi' painted on the side of a truck going down what appears to be Keshavarz Boulevard. The Islamic Republic News Agency reported that '200 people' protested in front of its building today. More new footage coming in. Protesters help the wounded in what can only be described as a makeshift field hospital. Footage purportedly from Ferdowsi University, Mashhad. 'Death to the dictator!' 'As long as Ahmadinejad is around, every day will be like this! ''Hemmat and Bakeri were true Basijis!' referring to two famous martyrs. A dozen plainclothesmen mingling among protesters suddenly rush two youngsters and arrest them in what appears to be Hafteh Tir Square. Footage of the exalted Leader's picture getting trampled. As night falls on the city, pockets of protest persist around Tehran: Enghelab Square, Tehran University, Vali Asr Street, 7th Tir Square, and Laleh Park. Radio caller: I'm 21. I just got back 30 minutes ago. I've been protesting all day long. Four of us caught a Basiji who was beating a girl in some alley, we pummeled him so hard, he was close to tears and couldn't get up. Preparing for a pitched battle in front of the Petroleum Industry health services. Caller to Radio Farda (elderly woman): I was in the demonstrations this morning. You can't imagine the number of security troops that had been deployed. It looked like there was one regime agent for every protester. And all this to confront people with nothing to defend themselves with. I finally understood today how scared they are. This regime is over. Riot police hunt for protesters. Radio Farda reports that opposition leader Mir Hossein Mousavi is in state of house arrest. 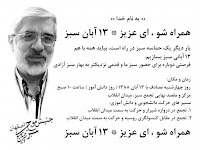 Mousavi had planned to attend today's rally in Tehran, but his house was surrounded by motorcycle-riding security forces this morning and he was prevented from leaving the premises. Police brutality in a video that was purportedly filmed today in Tehran. 'The Russian embassy is the real den of spies' shout the protesters, using a phrase that the regime employs to describe the American embassy. 'We are Neda, we are Neda, we are all one voice!' Neda, the name of the famous protester killed in the regime's post-election crackdown, also means voice in Farsi. Video allegedly from earlier today, Azad University, Mashhad. Footage purportedly from today in Mullah Sadra Street, Shiraz. France has condemned the violence against protesters and the arbitrary arrests today, according to Le Figaro. Bernard Valero, spokesman of the French Foreign Ministry, made the declaration early in the afternoon. 'We condemn this new wave of violence and repression. We salute the courage of all those in Iran who fight peacefully for their fundamental rights,' said Valero. Purportedly from earlier today, Karroubi arrives in one of the side streets leading to 7th Tir Square. Protesters rushing towards Karroubi who can be seen at the start of the video. Radio caller says that many friends have told him they will join protests once they leave their offices at the end of the work day. News channel France 24 is broadly reporting on the protests in Tehran today. Caller on ePersian radio: I'm a 60-year-old woman, almost 60. I joined the demonstration early today and moved towards 7th Tir Square. There were so many protesters. They must have bought security forces from around Iran and they were merciless. I've gone to all the demonstrations and I've never seen such violence. We started chanting and they chased us down a dead end. We were all crushed together and the anti-riot forces shot something like 5 tear gas canisters into the alley. I thought my time was over and I would suffocate. Then the anti-riot forces came into the alley started beating us with their batons. I was hit on the waist and the mouth. Protesters were all over the city today. They would get beaten in one place, then they'd go to another crossroads and start chanting again. This regime must go! It pained me to see the young people struck like that. I'm going to rest, then I'll go out again, because the protests are going to pick up again at 4 PM. Roads leading to Isfahan University are blocked by the police in an attempt to stop several groups of protesters from joining each other. Chants of 'Death to dictator' can be heard. Several thousand green supporters gathered in Azadi Square. Several thousand students are also protesting in Sistan University. Clashes are reported on Ghaem Magham Farahani Street, where large numbers of protesters are responding to attacks of the security forces with rocks. Street battles are also taking place on Vozara and Takhteh Tavous streets, according to several radio callers. Revolutionary Guards special forces on motorcycles prepare to charge down an avenue. One of Mehdi Karroubi's bodyguards has been taken to the hospital, according to Mowjeh Sabzeh Azadi. Caller to ePersian radio: I'm on Azadi. This is hand-to-hand combat. We're at war with a filthy regime. Why don't our clerics say anything? The kids have decided to stay on the streets all day and tonight. Please tell people to bring water and food to the protesters. Various sources claim that security forces are resorting to even greater savagery than in the most violent days of the post-election crackdown. Habibollah Peyman, founder of the Combatant Muslims Movement and a leader of the Council of Nationalist Religious Forces, and his wife were so badly beaten by security forces that his head was broken during demonstrations today, per Mowjeh Sabzeh Azadi. Al Arabiya reports that Basij forces have surrounded the home of opposition leader Mir Hossein Mousavi. Protesters build fire against the effects of pepper gas. Thousands of Iranians who had convened in Hafteh Tir Square and intended to march to the former American embassy were savagely attacked by plainclothesmen and the special forces of the Revolutionary Guards. Plainclothesmen and the special forces of the Revolutionary Guards (IRGC) assaulted the defenseless people of Iran with batons, tear gas, pepper gas, and shots fired into the air. According to witnesses, IRGC forces on foot and on motorcycles targeted the heads and faces of people who had only gathered to denounce domestic and foreign tyranny. 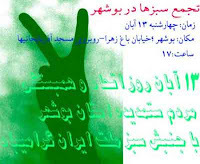 In other parts of the city, including Motahari Street, Shahid Beheshti Street, Karim Khan Zand Street, Mofatteh Street, Azadi Square, the corner of Taleghani and Palestine streets, Nejat Elahi Street, and GHaem Magham Farahani Street, the people of Iran are currently chanting against tyranny and dictatorship. Although the state media have employed all their efforts to belittle the grandeur of the green nation of Iran, eyewitnesses understood the massive presence of green supporters of democracy against the club-wielding forces of dictatorship. 'Neither eastern, nor western, a green national government!' Purportedly earlier today, near Hafteh Tir Square. Footage purportedly of earlier today, next to Hafteh Tir Square. Demonstrators are charged by riot police. More footage purportedly from today. 'The Russian embassy is the real den of spies' in reference to the Islamic regime's habit of calling the US embassy a den of spies. Caller on ePersian radio: I'm on Vali Asr Street. The security forces are beating people like animals, but the protesters are not backing down, especially the women. You should see how the women are raising a riot. Female caller on ePersian radio: I was injured in demonstrations this morning, but I'm going out again in a few minutes. Photo purportedly of today's protests in Tehran. Caller to ePersian radio: Clashes are extremely violent on Vali Asr Street. Security forces and plainclothesmen are pitted against protesters who are defending themselves. Protesters are not afraid anymore. Over two dozen arrests so far. Protests are dispersed between two squares in the city, Alam and Pardis. Security forces and plainclothesmen savagely attacked protesters. Caller to ePersian radio: My sister was assaulted by plainclothesmen in Hafteh Tir Square. She came back home and rested, but now she's gone out again to protest. Mohammad Taghi Karroubi, Mehdi Karroubi's son, spoke to Radio Farda: Mehdi Karroubi was present in Hafteh Tir Square. Police forces directly shot tear gas at him and his supporters. One of his bodyguards was injured on the head. Two other bodyguards were also wounded. Karroubi's face was slightly burned by the gas. He was not arrested. Karroubi and his family do not fear any outcome and are ready for the worst. The regime warned us that a suicide attack might take place against Karroubi and that he should not attend the rally. We declare that the regime will be held responsible for any assassination attempt against Karroubi. Mehdi Karroubi was beaten by regime goons, but he was rescued by his bodyguards and taken away in his personal car, according to Mowjeh Sabzeh Azadi. Caller on ePersian radio: (In tears) Please help the people of Iran. My sister was in Hafteh Tir Square and was beaten by the security forces. She's at home now and not well. My sister is pious and wears a chador. She saw plainclothesmen throw youngsters to the ground and jump on their legs to break them. People take shelter in a private home near Roosevelt Street. The number of protesters is growing at the entrance of Tehran University. Large crowds building at Enghelab (Revolution) Square and Amirabad (Kargar Shomali) Street, according to Mowjeh Sabzeh Azadi. Security forces launch mass attack on protesters. Footage taken from pedestrian bridge in Karim Khan Zand Street, near 7th Tir Square. First footage arriving from Hafteh Tir Square. Protesters chant 'Death to the dictator!' as they are harassed by security forces. 'Don't go into the side streets,' shouts one man. The crowd of protesters is growing by the minute in Daneshjou Square, per Mowjeh Sabzeh Azadi's reporter on the ground. Caller on ePersian Radio: Paint is being sprayed on protesters. Hafteh Tir Square and all incoming streets are teeming with people. It's beautiful to see this. Karroubi was beaten and perhaps arrested. Caller says he personally saw Karroubi beaten on Modarres and that he was perhaps arrested. Protesters have been arrested in Ferdowsi Square, according to Mowjeh Sabzeh Azadi's reporter on the ground. Caller on ePersian radio: I've taken shelter in someone's home near 25 Shahrivar Square. Security forces savagely assaulted protesters. Massive crowds on Vali Asr Square. Karroubi had to be taken away in his car by his bodyguards after attack by plainclothesmen. The official regime ceremonies have ended. Despite use of tear gas and disproportionate violence by security forces, protesters managed to defend themselves against security forces and also beat up Basijis. Security forces are using parking lots of private buildings as holding areas. New protest front is building up on Vali Asr Street. Takhteh Tavous Street has been completely closed off, according to caller on ePersian Radio. Protest at Isfahan University, according to Al Arabiya. Caller on ePersian radio: Crowd being dispersed on Taleghani Street. Security forces opened fire on protesters on Hafteh Tir Square, according to Mowjeh Sabzeh Azadi's reporter on the ground. People are taking shelter in homes near 7th Tir Square and Karim Khan Zand Street. Mehdi Karroubi has arrived at 7th Tir Square, according to Iran Press News. Side streets near 7th Tir are being used as temporary holding areas. Protesters are arrested, blindfolded, and taken off on motorcycles, one plainclothesman driving, one behind the detainee. They are taken to the side streets near 7th Tir Square. Al-Javad mosque is being used as an HQ and holding area by security forces. Shots fired into the air in Iranshahr Street, per caller on ePersian Radio. Large green banner held by protesters at the end of Karim Khan Zand Street. They are faced with a line of security forces. Large crowds on Zand Street. Security forces are showing restraint. Caller on ePersian Radio: Karroubi is moving down Ghoddousi, I think, towards Hafteh Tir Square with a very large number of supporters. Security forces are very savagely beating people in Hafteh Tir. Karim Khan Zand Street, close to Hafteh Tir Square: Tear gas shot at people. 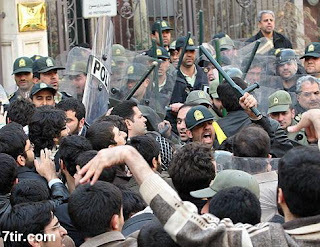 Protesters attacked a group of a dozen Basijis, according to caller on ePersian Radio. Security forces are beating protesters moving from Tehran University towards 7th Tir Square, according to Mowjeh Sabzeh Azadi. South of Hafteh Tir Square: Ten to 15 individuals arrested, according to a caller on ePersian Radio. She said that a woman was being beaten and security forces took away the mobile phone of an individual filming the incident. But another caller on ePersian said that the police was not exercising any violence towards the opposition protesters. Security forces initially surrounded Tehran University to block students inside, but the students broke through the cordon about an hour ago. Tear gas fired in Hafteh Tir Square. Students amassed at the entrance of Tehran University chanted 'Death to the dictator' and have started making their way towards official cortege moving from Tehran University Mosque along Taleghani Street, according to Mowjeh Sabzeh Azadi. The following are meeting points and demonstration routes announced by various local chapters of the Green Movement for November 4. They are not final and only represent the latest information gleaned from various sources. They are subject to change and will be updated as more information comes in. The Iranian regime is waiting until the last possible moment, Tuesday evening, to announce all official meeting points and routes. The opposition has announced it will be present on the same official routes. Tehran University Mosque, along Taleghani Street, to the former American Embassy compound on the corner of Taleghani Street and South Moffateh Street, south of 7th Tir (Hafteh Tir) Square. Mir Hossein Mousavi and Mohammad Khatami will march along Taleghani Street, according to Radio Farda. 7th Tir Square, down South Mofatteh Street to the former American embassy compound on the corner of Taleghani Street. Amir Kabir University, along Sommayeh Street, up South Moffateh Street, to the former American embassy compound on the corner of Taleghani Street. Route 1: Shiraz Gate (Darvazeh Shiraz) to Enghelab Sq. Route 2: Russian Consulate to Enghelab Sq. 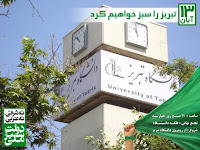 Green fliers calling on protesters to join the November 4 rally flew out of a third-floor window at the northern Tehran branch of Azad University. 'It's a green wave,' says one young woman. Let me say that getting four newspapers to launch attacks or rallying four kids in Ghom... the era of these things has passed. Even if they get the Friday prayer leaders to say something, everyone knows that these imams are in their pay. These things don't carry any weight anymore. The newspapers wrote so many things and the people just insulted them. These things must change. We have to tell Mr. Khamenei, 'Issuing religious decrees is not for you.' I've gathered 12 reasons here. We have to act on this, find a solution. What's this talk of marjaiyat? (NB The quality of being a source of emulation for Shiites) You're not on that level! I warned him about this. It was just before Ayatollah Araki's death (NB This senior cleric died in early 1994) and I sent this letter to him by way of Ayatollah Momen, and he received it. I'll just read point 7. I sent him this message and, well, he didn't want to listen. Who has the right to dispatch four kids to the seminaries to disrupt their work?! The date of this letter is the 12th of Aban (NB November 3), when they'd just taken Ayatollah Araki to the hospital. I sent this message through Ayatollah Momen. There were seven points and this was just one of them. And Ayatollah Momen told me about several of these gentlemen who had gone to see Mr. Khamenei to ask some questions. So I said, But he doesn't have any resaleh (NB collection of fatwas or religious rulings issued by a Shiite source of emulation). He said, Well, he says they're fatwas, so they're fatwas of the Imam. Isn't this weakening Shiite marjaiyat? They rallied four kids and brought them to the Association of Teachers [and Researchers of Ghom's Seminaries]. Four kids, on the night of Ayatollah Araki's death. I was in Ghom. They got them to march in the streets, there were no more than seven kids they had brought over from Tehran. They were saying, he [Khamenei] is among the [sources of emulation]. Well, without beating around the bush, he isn't on the level of a source of emulation and he doesn't have the right to issue fatwas! They've weakened Shiite marjaiyat with four Intelligence Ministry kids. These are the tragedies that we see in this country. May God preserve this country's independence. The country's universities continue to simmer in the days leading up to the mass rallies of November 4. The south Tehran branch of Azad University was the scene of protests on Tuesday. Students chanted, 'The Russian embassy is the den of spies' using a term that was used against the American embassy after it was raided by revolutionaries in 1979. 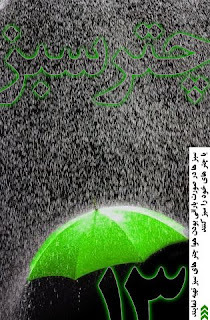 Badamchian goes down memory lane and recounts some of the events surrounding the seizure of the American embassy in 1979, before chiding the green movement's planned slogan for November 4. So what is the slogan? 'Neither eastern, nor western, a green national government.' No, a green Islamic government! Why national? [They say], because it is the day of the regime's nightmare of its own death; November 4 is a day of struggle against religious tyranny. They don't mention America or the den of spies. Why? Badamchian then faulted Mir Hossein Mousavi for declaring victory too early during a press conference on the night of June 12. Kavakebia rejoined with his own persuasive arguments. ...as for his [Badamchian's] comments about him [Mousavi] declaring that night that he was the winner... Well, Mr. Badamchian, go and look at the Islamic Republic News Agency's bulletin at 9:30 PM. It says that Mr. Ahmadinejad is the winner with 63% of the vote. (laughter) Before all the votes were counted! And that's exactly what the final count was: 63%. (applause) No, please, let's not allow this to become emotional. We want to have a debate. And when he [Mousavi] saw these announcements before the fact, he thought, I'm seeing the numbers for Tehran and the current situation, then I'm the winner. [...] Then he [Badamchian] says that the post-election demonstration was illegal. All right. What about Mr. Ahmadinejad's victory celebration in Vali Asr Square? Was that legal? He has the right to celebrate before the Guardian Council has made any announcements, but the people who have grievances should not come into the streets?